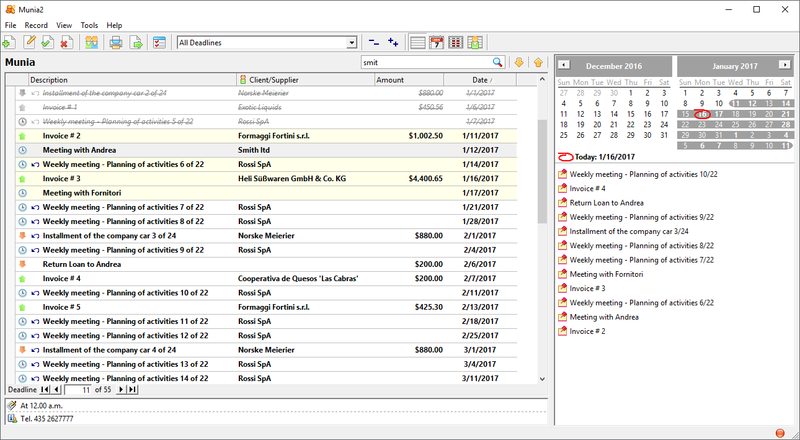 Munia 2 is a scheduling software (time-table) that allows you to efficiently manage your accounts and appointments. It is based on an electronic data sheet system (*) designed to help you keep a track of your commitments (deadlines, appointments, debits, credits) providing you with an easy-to-consult record of client / supplier balances and amounts due. (*) All Data managed by MUNIA 2 is kept locally, is not transmitted over the Internet or shared with third-party companies.